Working with Code 7 on my new website and on the company re-brand was a great experience. I am really proud of the site and love the new logo and format they came up with... I couldn't be happier! Along with branding materials that effectively promotes the three|eleven brand. The design brief was to create a logo to be used on the website, business cards, portfolios, scaffolding, adverts, etc. Clean lines and authenticity were the main design aims for the project. To best reflect the nature of the work, the website is highly image-led. High quality photographs are the focus, with creative touches through editing. Responsive photo galleries with filtering make the website visually engaging and easy to navigate. The business cards were a Colorplan duplex with blind emboss on one side and foils on the other. The Colorplan range is an iconic collection of premium coloured papers and boards first developed in 1972. The stationary is simple and effective, using elements of branding from the website. A Brighton based architectural firm providing a high standard of construction & design work throughout Sussex and London. The company was started by Rob Beer, a graduate of Brighton University in 2008. 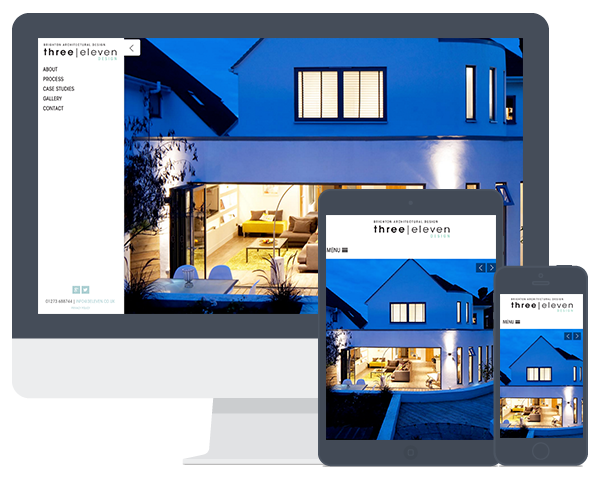 Over the five years in which three|eleven has been designing and developing peoples ideas, the company has worked on a vast range of projects ranging from small to large, residential to commercial and everything in-between.